This is a series of lectures which Steiner was asked to give while giving the Light Course (GA 320). The translator Teutsch tells us, "Not only did he teach a scientific course with only a minimum of equipment, but he was willing to improvise a course on language, requested by the teachers only on his arrival in Stuttgart." (Page 13) And amazingly, he gave them both during the same period of a week or so. The translator herself did an amazing job of giving us English speakers access to Steiner's insights, most of which deal with his native language, German. She adds ample English examples in brackets to complement the German examples and place single word or phrase translations into English in single quotations following German ones. [page 103] Nothing can be more telling about Rudolf Steiner's depth of insight into widely disparate subjects, than the number of trouvailles or "hits" he achieves in what is — admittedly — a merely improvised series of hastily arranged lectures at the request of a number of friends. Few, if any, during the course of the past two thousand years were able to do what Steiner did, day in and day out, during the entire course of his life. Language was no exception in this regard. Steiner's intuitions, as seen from the vantage point of what we today consider scientific linguistics were all on the right track . . .
Concepts may spring into being from the spiritual world but cannot be communicated unless the concepts are clothed in words. This is what happened when Christianity spread northward from Rome to northern and central Europe — the peoples there were unable to grasp the content of Christianity with their native words and sounds. [page 25] Therefore, those who brought Christian concepts and Christian perceptions also brought their "word clothing." . . . In the same way, everything connected with schooling streamed northward, too, words like Schule 'school' itself, Tafel 'blackboard', and so forth. 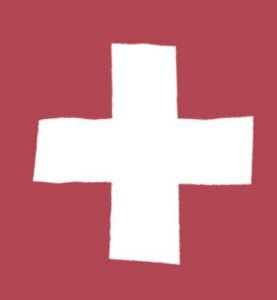 [They] have been integrated into the German language organization so thoroughly that no one today would recognize them as loan-words. [page 19] Everything pertaining to school entered our language from outside; it came — with education itself — with Latin or the Romance languages from the South. In English we may call someone who makes puns a "punster" and in German they call someone who makes shoes a Schuster. The root of this German word comes from the Latin sutor and it came about when the Italians (and other immigrants from the South) taught the Germans to sew their foot-coverings instead of merely tying them together. Our word for sewing done by surgeons is "suture" and it comes as well from the Latin sutor which means sewing. Note how this gives us a specific example of how concepts, new ways of doing or thinking about things, arrive with their own "word-clothing." Ponder everything you learned about consonants and vowels in school, and you will likely, as I did, only recall being taught about the separation of the alphabet into 5 vowels and 21 consonants, and not much more. In these lectures, Steiner gives us much more to consider. Consonant sounds are those we make in imitation of the world outside of us. This easily explain the prevalence of consonants in the speech of primitive folk, such as the tongue-clickers of Kenya. Cultures just learning languages use gestures to discuss features of the outside world. This is something that it's possible to watch today as people use gestures to complement their speech, especially when attempting to describe some physical object. Soon these gestures feed into the body and modulate the speech mechanisms to create analogous consonant sounds. Examples which come to me are words like flutter, jingle, tintinnabulation, etc. The consonants chop up sounds flowing from the larynx like the action in the outside world portrayed by word the consonants comprise. In the case of vowels — Aah! There's the power of vowels! They allow us to express our inner feelings in a situation. "Oh, Boy!" is a demonstration of enthusiasm as much as a verbal phrase of language. Its power resides in the powerful repeated vowel, "O". Anyone hearing that expression can immediately and directly pick up the excitement inside the speaker. Over the ages, the primitive peoples speaking only consonants begin to discover vowels along with the discovery of and wish to represent their inner feelings. The vowels begin to be interlaced with the consonants to form a type of speech we are more familiar with now. In an interjection the translator states, "Wadler once described the consonant as the musical instrument on which the vowel-melody is played, hence the ever-changing vowels in epochs of time and in comparable languages." When one begins to grasp the interplay of consonants and vowels in language rightly, one must agree with Steiner that the "bow-wow" theory of language development(1) is barking up the wrong tree! As he says further on page 28, ". . . the 'bow-wow' or 'ding-dong' theories are horribly wrong. They are incorrect and superficial." Speech sounds, rightly understood, are connected with whatever we want to reveal of soul and spirit. Steiner tells us that translations from one language to another should be made by the heart, not by the book. [page 34] Words in general have the most varied transitions of form and meaning, of course; translations following only the dictionary are artificial and pedantic. First of all, we should follow the genius of language, which really has something other in mind than what seems obvious at first glance. One of my favorite etymologies done by Steiner was when he tracked down Lord and Lady as the Keeper of the Bread and the Kneader of the Bread. Bread was originally a Gothic word hlaifs from which we get our modern word for a unit of bread, "loaf". In Old English hlaford or hlafweard meant "bread keeper" — note the ending weard appears in "steward" which refers to a keeper of some property. Shortened over time, hlaford morphed into "Lord." On the other hand, hlaefdige in Old English referred to "one who digs into the loaf" or a "bread kneader." Over time, it morphed into Lady. Languages also evolve differently if the people live in a mountainous area or a low-lying plain. One can only think of the famous Swiss yodelers of the high mountains as one reads this next passage and compare them to the drawl of Southerners in the United States who for the most part live in low-lying areas with heavy, moisture laden air compared to the thin, light, dry air of the high mountains. As the word "Y'all" is voiced by a Southerner, one can almost feel the heavy air slowly being pushed through the larynx. [page 41] Languages start out with a primitive structure. What then brings about the differences in them? Variety is due, for instance, to whether a tribe lives in a mountainous area or perhaps on the plain. The larynx and its related organs wish to sound forth differently according to whether people live high up in the mountains or in a low-lying area, and so on, even though at the beginning of speech, what emerges from the nature of the human being forms itself in the same way. One interesting prefix is ge- which forms the middle of our word "together" and means a "gathering" or "coming together". If we place it in front of the word for hall selle you get in German Geselle "fellow" — a person who shares the hall or room with you. Add schaft and you get Gesellschaft "society." Many words beginning with ge- have an innate sense of coming or being together in them. Gleich means "very similar" or "identical" in German, and it stems from the joining together of ge- "gather" and leich "forms" or forms which are similar to each other. As I live and breathe, Steiner's next insight about double phrases got to me! Consider our familiar ones as provided by the translator: might and main, time and tide, rack and ruin, part and parcel, and head to toe. Note that the two parts are not reversible — one cannot say main and might and be comprehended in the same way as might and main. Professor Makkai points this out on page 119. He calls these dyads, "irreversible binomials" and adds these to the list: drawn and quartered, nip and tuck, and touch and go. What makes these dyads live in our language? They allow us to express something that we cannot otherwise pin down, but which is ineffable, so we use two partials to explain some whole we have no exact word to describe. With all our might and main, we will go to rack and ruin, and perhaps be drawn and quartered if we are unable part and parcel to communicate from head to toe what we mean exactly. Steiner gives us an example from the Middle Ages of the expression krankem Schilfrohr 'sick reeds.' What seems to be "sick reeds" to us meant merely "thin reeds" to people back then. Over time the meaning of being "thin" came to be applied to the thinness that accompanied sickness as people lost their appetite and grew thin from some disease. This kind of changing from descriptive to evaluative (thin to sick) was first described to my knowledge by C. S. Lewis in his book, Studies in Words. The translator inserts an interesting passage which illustrates this kind of evolution of three very common English words: amusing, awful, and artificial. Another amazing modifier is the single letter "l" when it is added to the end of a word which adds a feeling that something is moving about. Take the word "fond" which is means to like someone and add an "l" syllable to the end of the word and you get "fondle" which adds some moving and touching to the otherwise stagnant action of being fond of. You might "need" something from someone without ever mentioning it, but if you "needle" them, they will certainly be aware of the motions you are making to fulfilling your "need." The translator gives these English examples; tramp-trample, side-sidle, and tread-treadle. [page 81] Let us suppose we would like to speak about an angle. First, we have an image of a certain angle in mind. 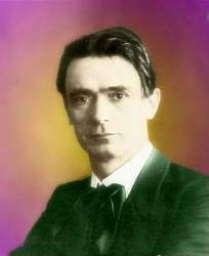 To describe the sides of the angle with our hand, we would do this [Rudolf Steiner makes a gesture]. What we do like this with our hand we actually do with our organs of speech in forming certain consonants. Language is in this respect only the audible expression of gestures that are not being made externally with the limbs but with much finer parts of the human organism, our beneficent air-organism. If you think about these inner laws, you will gradually develop the insight that language imitates either the outer world directly or imitates what we experience in the outer world through our feelings and sense perceptions. We mentioned the tongue-clicking of certain African tribes earlier to illustrate how primitive peoples will begin with consonants. Here Steiner lays out the progression of development from consonants to vowel to consonants again. [page 83] 'Tongue clicking' disappears when human beings begin to express more of their inner feelings through sound structure. Consonant formations must be considered the first step. Then the second step will be the vowel formations, but the inwardness found in vowel formations is actually a stage of transition. Finally the signs of aging in the genius of language appear: the vowel-forming power recedes and the consonant-forming power comes to the fore again. Our human language journey involving the development of language proceeds essentially from outward to inward and then from inward to outward. We can observe this procedure directly in the sound-structure; it is the intrinsic essential fact through the whole forming of language. It is the intrinsic, essential fact to such a degree that we encounter it in every aspect of language. Conjugating verbs is a hassle to anyone studying European languages, especially Latin. "Why do I have to remember all these ending for every verb?" is a common refrain. Steiner explains that the special ending for each verb is simply the adding on of a pronoun to the verb. In a time when people formed words by linking two already known words together, like an early English word for ship was "sea-horse," it was natural for them to link a pronoun designating who was performing an action to the verb designating the action itself. For example: salbom, 'I anoint' or salbos, 'you anoint'. At some point in development, as the people worked their way from outward to inwardness the pronoun was removed from the verb form and placed in front of it as a separate word, i. e., 'I anoint' or 'You anoint'. [page 85, 86] Repositioning the pronoun from the end of the word to the beginning and making it an independent word was the path to the greatest inwardness, the kind of inwardness that perceives how spiritually abstract our inner nature really is. Now the person is separated off and placed ahead of the verb. You can learn something important from this procedure if you go back to the primitive constructions of the language-forming genius that does not really know anything about an I or a you separated from external things, and that still presses into the word whatever has to be said about I or you. Later, the genius finds the pronouns within the word itself — Latin is a language at this level — and plucks them out, comes to a mirror image of itself, comes to ego consciousness, and then puts the I and the you up ahead of the verb. This growing sense of egoism, this arrival at self-visualization is reflected quite clearly in language development. One can say that becoming aware of oneself at a certain unconscious level has been achieved as the result of the ancient Apollonian precept "know thou thyself"; this was followed everywhere in the languages of the western world by taking the personal pronouns out of the verb forms. Consider now verbs which have prominent vowels in them, like "feel", "cool", "will", "wish" [RJM: note that "w" is actually a vowel sound formed of "ou"]. Such verbs are used to represent one's inner state of being. [page 86] With a little reflection you will realize that the verbs in which the vowel element — expressing inner sensitivity — is more important than the consonants are those that describe an activity we can connect ourselves with inwardly and wholeheartedly. This next piece of information was a revelation to me: the origin of our adding "-ed" to verbs to represent an action that took place in the past. [page 87] If you want to express the fact that [some action of placing happened] some time ago, you will say . . . place-did. You do place yourself, you did place yourself; in metamorphosis this becomes placed, for the -ed is the transformed did. [page 91] 3. Old English had many ways of forming noun plurals. The most common was the addition of -an, but -as (later -es, -s ) gained ground and finally carried the day. However, we still have oxen, children, kine, brethren. The mutation plural (changing the vowel) we find in geese, feet, mice, lice, men, and women. Each of us has an etheric body which normally nests completely within our physical body. But in cases of certain illnesses this supersensible body may separate itself from the body, a fact which will be visible to clairvoyant sight. As an indication that this type of sight was a circadian ability of early peoples, we can find idiomatic expressions still extant which point to that ability. We may say, for example, if a woman is acting crazy that "she is beside herself", "she is off her rocker", or "she is deranged". In German the word is "verrückt". [page 92] In cases where the supersensible does not quite fit into the rest of the human being, people felt: the etheric body is verrückt ['shifted', literally 'moved off its place', a word that today means 'deranged', 'insane', 'crazy']. This was then transferred to the whole person: Der Mensch ist verrückt 'that person is shifted', i.e., 'crazy'. A purely external fact is described, the displacing of the etheric body. Just this sort of picture-making, going back to the time when pictures of the spiritual world could still be observed, is exceedingly interesting. If people would only recognize this, if learned philologists were not so sound asleep, proceeding as they do quite surperficially on their materialistic tracks! If they could enter instead into the inward soul element that finds its expression in external language-forming, philology would turn of itself into a science of the soul and then into spiritual science. For this reason it is a shame that philology has become so materialistic; young people actually have no opportunity to observe the effects of soul and spirit on the forming of language. I attended public school in the United States and must say that I certainly had no opportunity to observe the effects of soul and spirit on the forming of the English language or any language, up until now. With the advent of Waldorf Schools in this country, this situation can change for the better through the study and sharing with our children such insights into the soul and spirit present in the genius of language from now on. Deli really loves it when my poems rhyme. She says, "Can't you make it happen all the time?" but only when it rhymes does she smile. Each of us has a little boy or girl that lives inside of us. The above poem was written for the little girl inside my wife, Del. For her many of my poems rhyme. The little boy or girl inside each of us is a feeler, a part of us which can tap into inward feelings and respond to them. It is the reason that nursery rhymes are so popular with children, and when parents read them to their small children, if they match with their children's feeling states as they are intensified by the repetitive rhymes, they will enjoy themselves as well(2). [page 94, 94] Therefore I believe that what I have given you in this course can be a practical, methodological extension of the course I gave before the Waldorf School began. And I believe that you can accomplish a great deal by pondering, "How should I organize my class teaching, translating all this into what is right of children — for it is possible to adapt it in every subject — so that it follows this process of drawing in a spiritual quality by means of concrete examples?" If you do this, you will not easily run the risk almost all teaching does of not getting finished with the load of subject matter. It is only when subject matter is shredded into atoms and systematized that you don't get finished with it, because it is so tempting to take up the single, atomized parts that are uncharacteristic and pile them up, trying to show what is characteristic. Of course, there are uncharacteristic examples in all the school subjects; using these means that a great deal has to be strung together. If you make the effort, however, to choose characteristic examples and develop what is spiritual through your examples, you will achieve a certain necessary economy in your teaching. I would be happy, my dear friends — and let it be said in all friendship, especially to those who are teachers here at the Waldorf School — I would be happy if two things have been noted in these improvised talks: First the stimulus toward educating yourselves in a kind of brotherly-sisterly alliance with the language genius; on the other hand, that the method of teaching is influenced to some extent by what I have just pointed out to you. Footnote 1. 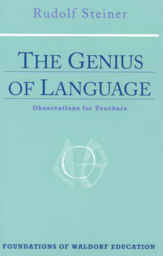 A theory which holds that language sounds began as imitations by human beings of the sounds in the world around them. Footnote 2. While doing the copy-editing of this piece, Del scribbled at this point, "Now I know why I like your poems to rhyme." If not Available for Sale, Check for PDF here.